Hogmanay, or New Year’s Eve, was a rather unpleasant day, weather wise – windy and wet – so a day to stay indoors, read and fill the house with the smell of freshly baked muffins. I have decided that I make muffins far too often, just because they are quick and easy and get devoured extra quickly by the 18 year old in the house. So while 2014 could be seen as the ‘Year of the Muffin’, I’ve decided that 2015 is going to be the year of the biscuit, and I’m going to focus on that this year (along with bread when I have time, which is never with this new job). Anyway, for my last muffins of 2014, I made cranberry and chocolate chip ones, using oil instead of butter, which makes a lighter muffin. For these you need first to heat the oven to 200C and grease a muffin pan (this mixture makes 6 really big ones or 12 ordinary ones). 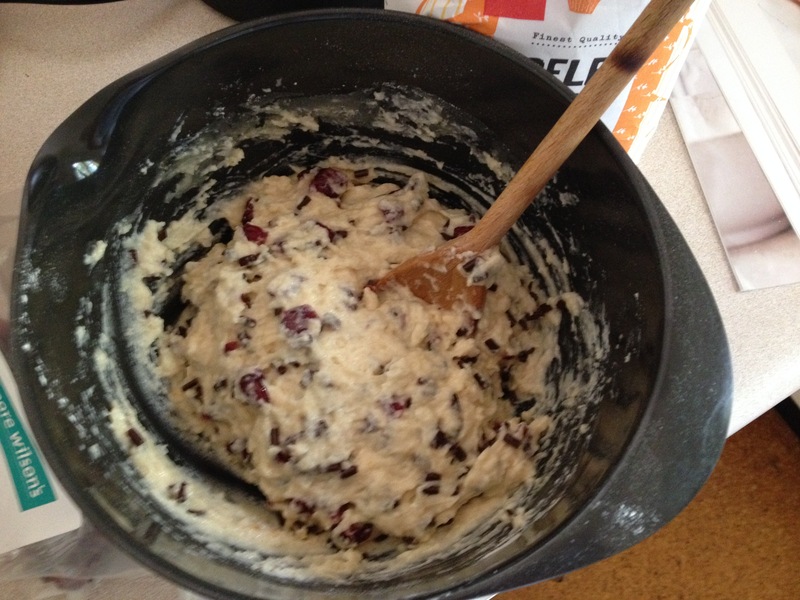 Sift 300g of self-raising flour into a bowl and add 150g soft brown sugar, 150g dried cranberries (you of course don’t have to be exact) and about 75g chocolate chips. Stir in 1 beaten egg, 180 ml buttermilk and 125ml vegetable oil. Spoon the mixture into the prepared pan and bake for around 20 minutes . So easy and so tasty too. There was no need, I felt, to include yet another picture of a baked muffin. You know what they look like! On New Year’s Day, with the weather back to summer sunshine, we headed off to the zoo. It was hard to believe that we hadn’t gone there already in the almost two years we have lived here. Quite a few of the animals were sleeping in the sunshine, but there was some action with the chimpanzees and other primates. 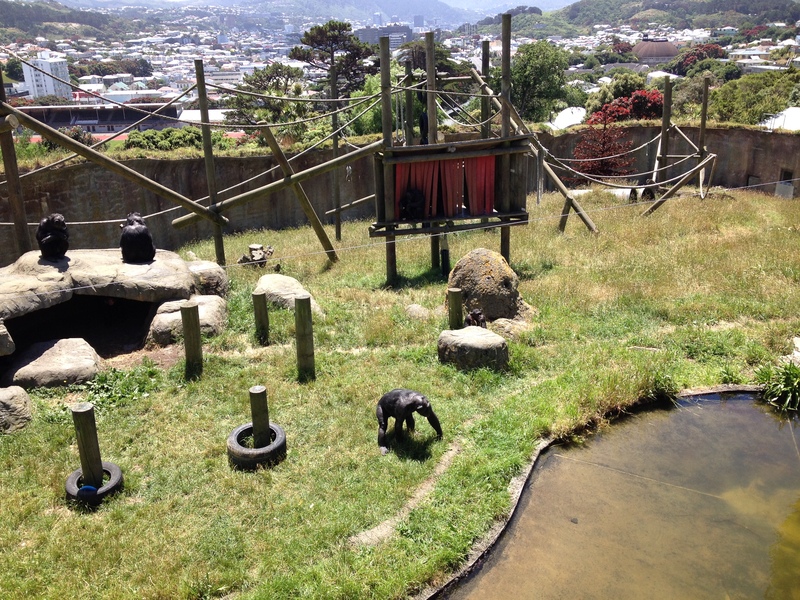 It was particularly fun to watch the chimpanzees catch, and ask for more fruit, with outstretched hands. One in particular was rather greedy, catching lots of himself. 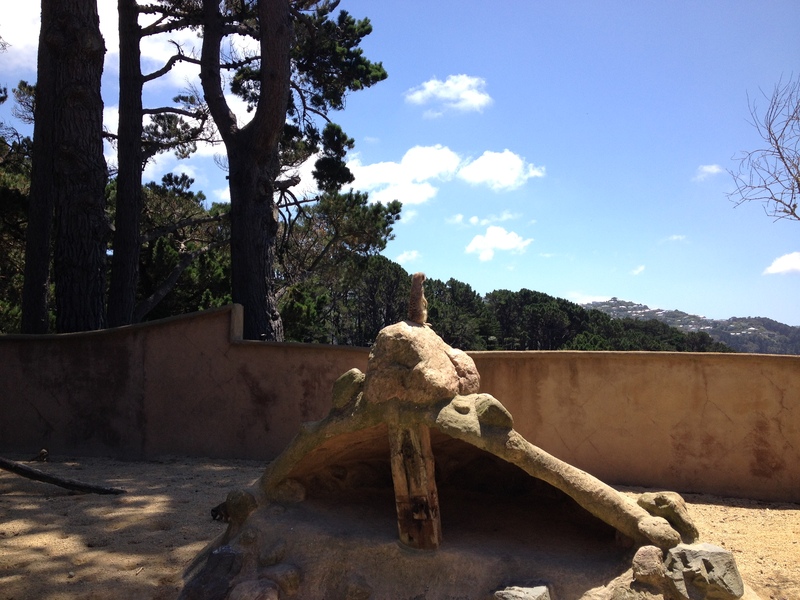 The meerkats were also active, though the kangaroos and most of the big cats were sleeping in the afternoon sun. 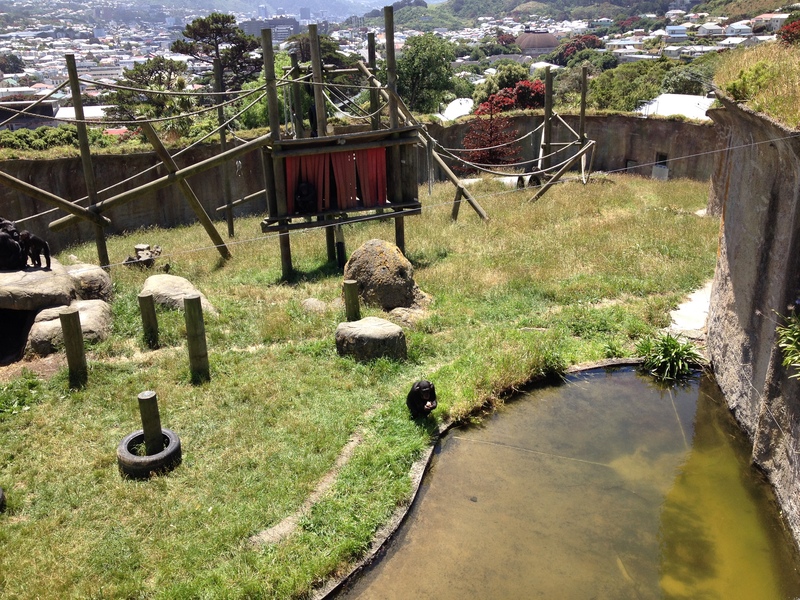 We were extremely lucky to see a kiwi in the special enclosure. Kiwis only come out at night, so the area, during the day at least when the visitors are about, is kept dark and lit with red lights that the birds can’t see/sense. The kiwi we saw is called Tahi, and has only one leg, one being lost when he was accidentally caught in a trap designed to catch stoat and other vermin. You can see a small clip of him here. We stayed for a short talk about kiwis, and also got to handle a life sized model of the huge eggs the birds lay (15% of the female’s body weight – poor creature can’t eat or drink in the last days before laying the egg as her internal organs are all squashed up) and also a stuffed kiwi. This meant you could really see the ‘whiskers’, like a cat, that they use to help them find their way around, and also to touch the feathers, that feel more like hair. Quite fascinating! 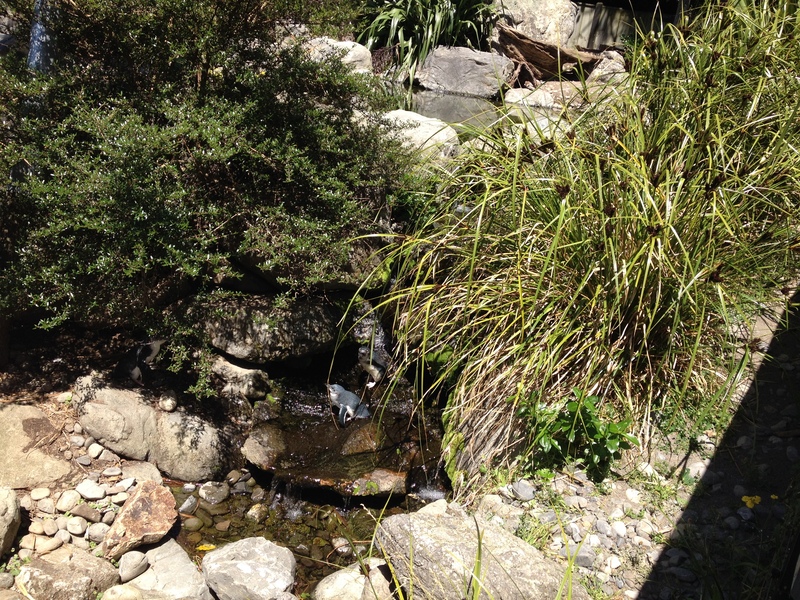 As we were leaving, a few of the blue penguins came out. These are indigenous to New Zealand and are the world’s smallest penguins. Blue penguins breed on the coastal mainland and islands of New Zealand and southern Australia, where they are known as little penguins or fairy penguins. I’m not one for resolutions, but I have thought about a few things I would like to do this year, apart from biscuit baking. One is to be able to stand up from the floor without using my hands (it’s all about practice) – if I succeed, I’ll let you know! That’s great! Lovely story. Apparently, they did try to make this kiwi a prosthetic leg with the help of Weta Studios, but he didn’t like wearing it at all and prefers just to hop about.